Yesterday, I got together with some friends from church to have a picnic and we participated in some good old fashioned fun. 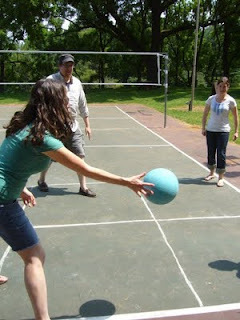 We played some foursquare (costs include $5 ball, and $1 chalk @ Target). The temptation during the summer months is to try as hard as possible to stay in the air conditioning by going to a pricey movie, eating out or lounging in a coffee shop. While none of those things are bad, it's important to remember that there is TONS of opportunity for next-to-free/fun entertainment everywhere in the great outdoors! We need to get out and embrace the sunshine and the heat. Once we're used to it, the heat becomes bearable and we can be free to participate in outdoor activities. It seems that during the summer, people are just way more willing to get together and gather in groups to barbecue and just hang out, so we'd be foolish to not take advantage of that. ...and there are plenty more. Gather some friends and revive an old game or play some news ones! Pat yourself on the back for indulging in cheap entertainment, you thrifter you! How to yard sale with the best of 'em!